In view of evolving scientific evidence on the benefits of Electronic Cigarettes vis-a-vis traditional tobacco products, administrators and public health organizations in many countries such as USA and Europe are adopting a moderate regulatory approach towards electronic cigarettes rather than taking the extreme action of undue restrictions on the product. 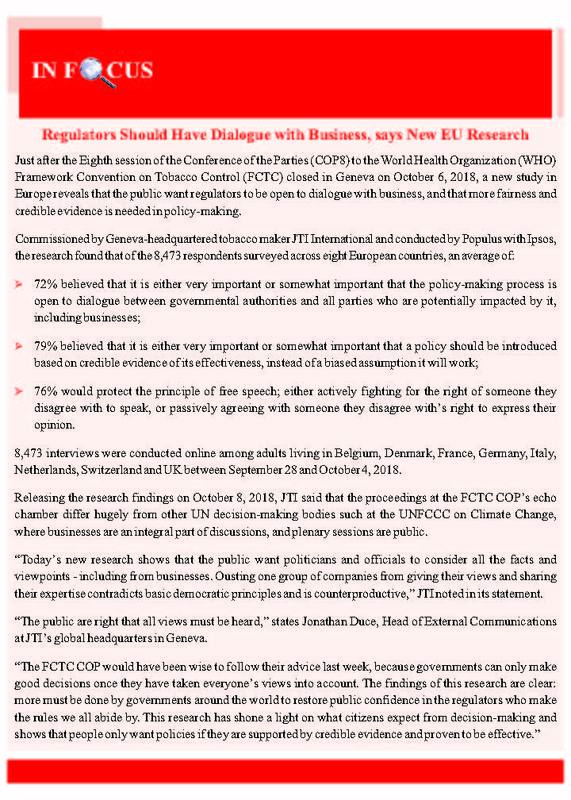 A moderate regulatory approach also cognizes for the importance for the creation of awareness of the new Electronic cigarette category, which would be enabling in the context of public health. 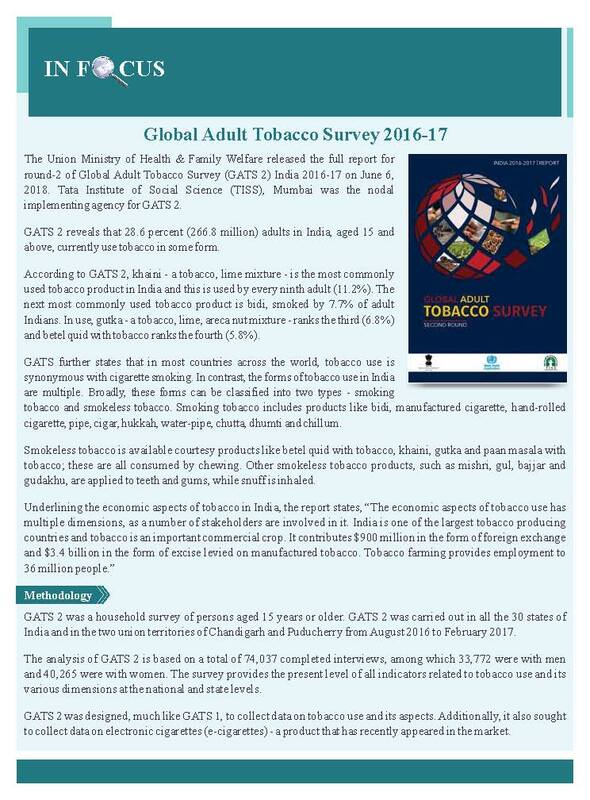 Any undue restrictions on electronic cigarette category would actually put Indian companies at a disadvantage, given the growing popularity of the category internationally, and would deny millions of Indian farmers, the enormous economic potential that the development of this innovative product can otherwise offer. Electronic cigarettes are actually Electronic Vaping Devices, which are an innovative product category. These electronic vaping devices do not contain tobacco in their use; there is no smoke or tar, which is associated with smoking tobacco products. Therefore, the health risks, commonly associated with tobacco, are absent here. In fact, studies have found these products to be safer alternatives to tobacco products. This is one of the main reasons for the strong growth being witnessed internationally by this new product. According to Euromonitor International, a renowned research organization, the global market size of this product has already reached around US $8 billion in 2015, growing at a CAGR of nearly 50% since 2010, and is projected to grow to US $23 billion by 2020, with a CAGR of nearly 25%. 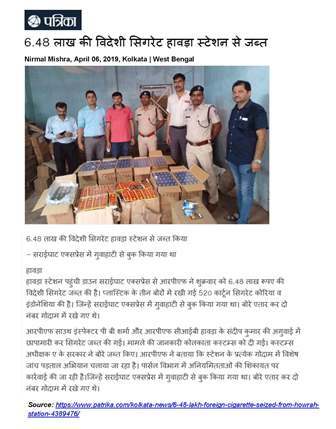 Given the acceptance of this product undue restrictions on Electronic Cigarettes pose the serious threat of illicit trade, opening up channels of illegitimate business. 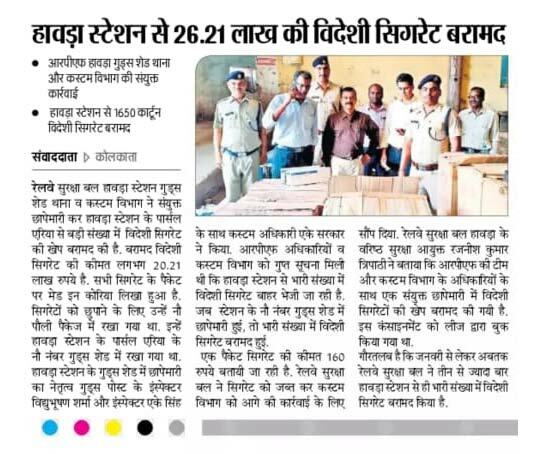 This would lead to wide-spread cross-border contraband trade resulting in significant loss of revenue both at the State and Centre levels. 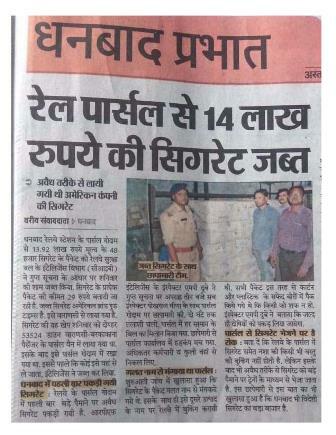 Moreover, with regard to such illegal products there will be no assurance of source, quality standards or compliance, making them highly suspect. Further, restrictions on the category would also impact the development of technology by Indian companies in this field. International companies are investing heavily and are patenting technology in these products. Hence, any undue restrictions in India will only strengthen the International companies’ hands and weaken research and development by the Indian companies, with all intellectual property in technology belonging only to overseas entities. This will deprive Indian companies of developing technology and related Intellectual Property to compete meaningfully with foreign entities for these innovative products. 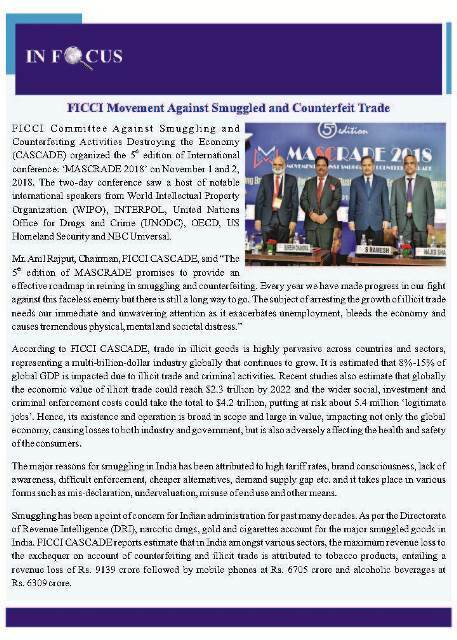 It is evident that vested interests want restrictions on electronic cigarettes in India so that foreign products owned by overseas companies brought illegally into the country gain ground in the market without there being any domestic competition to challenge the illegal trade in these devices. Tobacco is the main source of nicotine, which is used in small quantities in the e-liquid of the Electronic Vaping Devices. However, a large amount of tobacco is needed for extracting any significant amount of nicotine. 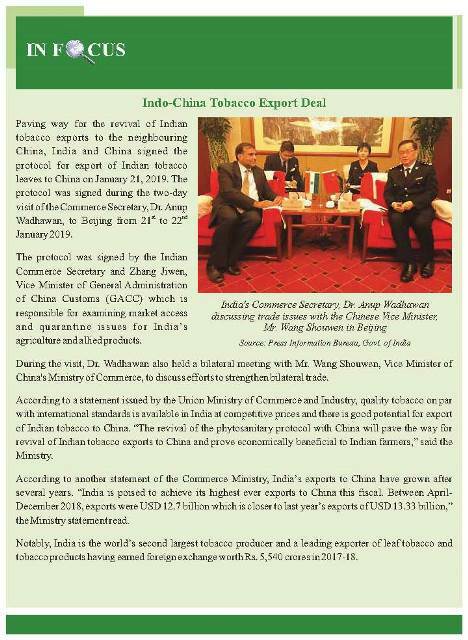 India, with sizeable tobacco production, can benefit from the opportunity by tapping the growing demand for nicotine from the internationally growing Electronic Vaping Device market. 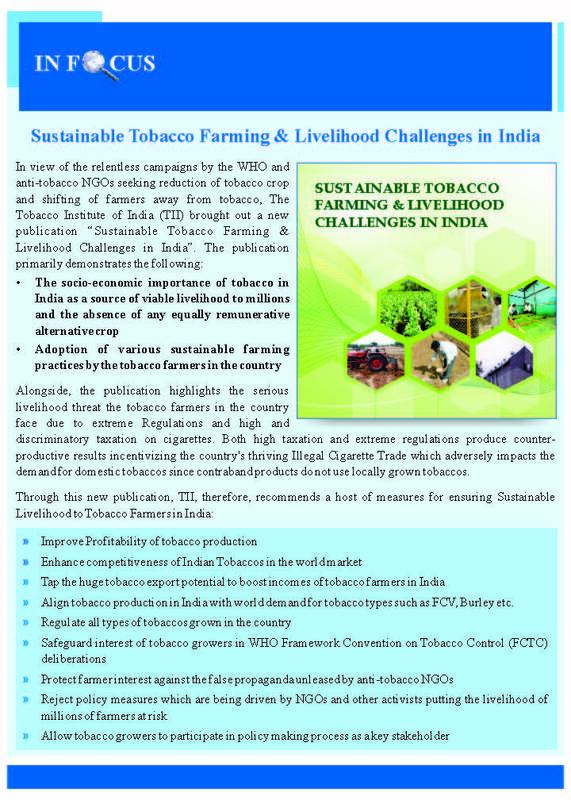 This would also protect and improve the livelihood of millions of farmers and farm labour engaged in cultivation of tobacco in India. 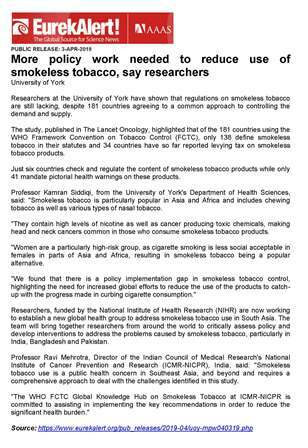 While regulatory bodies have concerns whether e-cigarettes are a “gateway” towards combustible tobacco products, the emerging evidence completely over-rides this hypothesis. In July 2016, Public Health England and eleven other UK public health organisations, including British Lung Foundation, Cancer Research UK, Royal Society for Public Health and Royal College of Physicians, issued a joint statement stating that “the public health opportunity is in helping smokers to quit, so we may encourage smokers to try vaping”. New Zealand, a country which heretofore had prohibited electronic cigarettes has in August 2016, released a document in which it is stated that “after considering evidence and concerns about e-cigarettes, the Government has agreed in principle to nicotine e-cigarettes being legally available for sale and supply in New Zealand”. Many more countries should take a leaf out of New Zealand’s realization and actually promote categories which help in public health improvement. 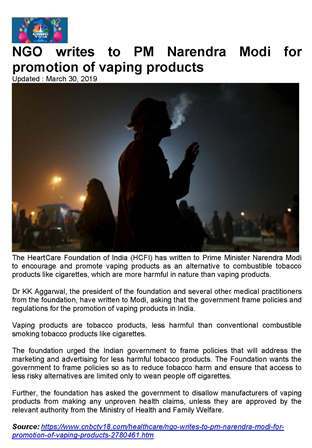 Emerging products like electronic vaping devices have the potential to provide a decisive technological fillip to Indian companies and safeguard the interests of the tobacco farming community through nicotine extraction that can be put to alternate uses. Any unfavourable restrictions on e-cigarettes will be an extreme measure in view of the global acceptance of these products as a safer alternative. In fact, in the interest of public health, it is important that any regulatory approach should enable the awareness of this new innovative category.